This Wed, May 2nd we are not meeting in normal small groups. We instead are joining high school students from all over East County for an evening of prayer and worship. It is the night before the "national day of prayer" when our nation is challenged to spend the day, praying that God will move amongst us and thanking him for the ways he already has. We're meeting from 6:45 to 8:30pm at El Cajon Wesleyan Church. Please drop your student off directly at 1500 East Lexingon Avenue, in El Cajon, 92019- NOT at Journey. Click here if you need a google map from Journey to El Cajon Wesleyan. Our student ministries version of the JOURNEY UP series started this last weekend and will run parallel to the main service on Sundays.... finishing with our own Student Ministries version of the Big Event on Sunday, May 27th. 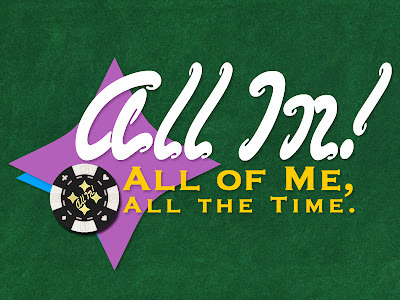 Ours is called, "All In" and we're challenging students to decide to bet all they have on God. To go "All in- all for God, all the time"... kinda like someone who is willing to risk it all in a game of poker. Instead, we're willing to and challenging students to bet their whole life on God. This week we looked at 2 very famous passages of scripture... one called the "Shema" in Deuteronomy 6:1-9 and another when Jesus quotes it in Matt 22:34-40. LIVING ALL FOR GOD, WILL CHANGE ALL OF ME. #1. DO I WANT ALL OF GOD OR JUST THE PART OF HIM I’M COMFORTABLE WITH? #2. DO I REALLY WANT GOD TO USE ALL OF ME, AND CHANGE ALL OF ME? We then discussed 5 main areas where we will see change and drew a parallel to the 5 purposes we are challenging students to embrace with their whole lives as the foundation of Encounter. I no longer live for myself, or to please people, I live for God. I no longer believe that it doesn't matter if people live for God or not. Their present and their future is very valuable to God and what they bet their personal life "chips" on matters to God and thus it matters to me. This is not so I begin to please God, it is because my focus has changed. Change is the natural result of a life connected with and directed to God. When I'm ALL IN for God, then that means ALL in. It will affect how I spend my time, my money, my resources. All of me. Neither the Shema nor Jesus' summary in the greatest commandments were given to individuals. They were given to the "community of believers." We have not been called to follow God alone, we've been called to do so as a community. We all rise and fall together. This task we call "journey up" is not going to be accomplished by one individual. It is only possible when the community of faith gathers around. We are part of that community.